William III of Orange was born at The Hague on 4th November, 1650. He was the posthumous son of William II of Orange and of Mary Stuart, Princess Royal the eldest daughter of Charles I and Henrietta Maria of France. His grieving mother had given birth to him in a chamber draped with black mourning. William's father, the Prince of Orange, had died but a week previously on 27th October, of smallpox. William was not a healthy child, small and thin, with a slightly hunched back, he suffered very badly from asthma all his life. Tragically, William also lost his mother when he was but nine years old. On a visit to England after the Restoration of her brother, Charles II, she had contracted smallpox and died there. Being left alone at this early age, he developed a strong sense of self reliance. William received an excellent education and was brought up in Holland in the Protestant, Calvinist faith. His future wife and first cousin, Mary Stuart, was born at St. James Palace on 30th April, 1662, the eldest daughter of the future James II of England and his first wife Anne Hyde, daughter of Edward, Earl of Clarendon. Anne Hyde had been a maid of honour to William's mother, Mary Stuart. Mary's parents secret marriage had been occasioned by the fact that Anne was pregnant with his child. Although Charles II welcomed Anne into the family, the Queen-Mother, Henrietta Maria, felt James had married beneath him and opposed the marriage venomously. The child, a son, had died young. Catherine of Braganza, the Portuguese wife of Mary's uncle, Charles II, then king, was barren, which made Mary the next in line to the throne after her father. Mary was always her father's favourite daughter. Her mother died, probably of breast cancer, in 1671. Her father, who by then had converted to Catholicism, remarried in the hope of producing a male heir, his new bride, the beautiful Italian Mary Beatrice of Modena was only four years older than her new step-daughter. Mary and her sister Anne, on the orders of her uncle, King Charles II, were brought up as firm Anglicans. The marriage of the first cousins was arranged for diplomatic motives by Charles II. It did not get off to a very auspicious start, on first sight of William, Mary wept inconsolably. At twenty-seven, he was not an attractive prospective partner, with his thin, hunched body, extremely large aquiline nose and piercing eyes. Mary's sister Anne unkindly referred to him as 'Caliban', after the mythical Greek ogre of monstrous appearance. Her father consented reluctantly to the match. The wedding took place on 4th November, 1677 and was a dismal affair, the bride cried throughout while her father looked on anxiously, the Groom was austere and uncomfortable, with only King Charles II smiling and joking in attempt to lighten the dour atmosphere. After such an unpromising start, the marriage surprisingly proved to be a successful one, though it was never to produce any children. Mary was displaced in the Line of Succession on the birth of her half brother, James Francis Edward, in 1688. The English, weary of James pro-Catholic policies, and faced with the prospect that he now had a catholic heir to continue his work, invited William to England to redress the situation. William arrived in England on 5th November, 1688. James II, deserted by many of his followers and unnerved, it is reported, by recently reading of the fates of the deposed Kings Richard II and Henry VI, fled to France. A convention was set up to determine the government of the country in January, 1689, which came to the decision that James could be said to have abdicated. The crown was accordingly offered to Mary, however William would not agree to rule only in his wife's name, which he considered humiliating. The crown was consequently offered to William and Mary jointly. On her arrival in England, Mary was widely criticised for having no respect for the father whose throne she had come to take and she and Anne were compared to the unfilial daughters of King Lear. James himself wrote bitterly to Mary, disowning her and laying a curse upon her. A devout woman, Mary's actions bore heavily on her conscience in the years to come. William III and Mary II formally promised to rule according to law and to be guided by Parliament. The Declaration of Rights designated the succession was to go to Mary's children, then Anne's, failing those it was to pass to any children of William (who was strictly speaking only third in line to the throne) by another marriage. It declared that no Catholic could become either sovereign or consort and imposed a new Oath of Allegiance. Secondly, it decreed that no monarch could keep a standing army in time of peace except with the consent of Parliament. William never inspired the loyalty of his English subjects and was always dismissed as an arrogant foreigner who was chillingly reserved. The smog ridden air of London badly affected the chronic asthma he had suffered from since childhood and gave him a constant deep cough. The court was accordingly moved to the Tudor palace of Hampton Court, outside London. He spent much of his time campaigning abroad, in Ireland opposing James' attempt to win back the throne in 1690 and in the Netherlands from 1691 to 97. During the King's frequent absences Mary ruled England. In 1689, the Queen's sister Anne, after many miscarriages and stillbirths, gave birth to a son who survived, an heir to the throne in the next generation, named William in honour of the King. William created the boy Duke of Gloucester. Anne was dominated by her friend Sarah Churchill. A petty quarrel which developed between the sisters was made far worse by the interference of the termagant Sarah. William disliked Anne's boorish husband, Prince George of Denmark, which he arrogantly made no attempt to conceal. This culminated in Marlborough demanding command of the English forces, greatly angering the King, who in 1692 dismissed Marlborough from office. Mary failed to visit Anne during her subsequent pregnancy, the two sisters were never to speak to each other again. GlenoeThe unruly Catholic Highland clans were perceived as a threat to William's government. Consequently, the Highland chiefs were ordered to take the Oath of Allegiance by 1st January, 1692. 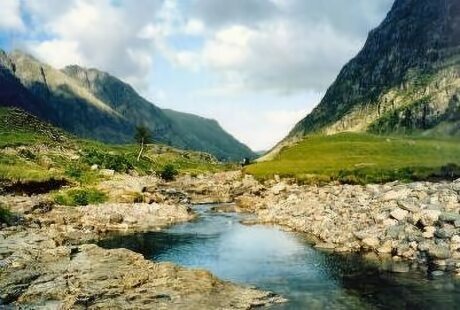 The chief of the McDonald's of Glencoe delayed taking the oath until late December,1691, and was informed on arrival at Fort William, that it could only be carried out in the presence of a sheriff and the nearest was forty miles away at Inverrary. Macdonald proceeded there to take the oath, but after the allotted deadline. Sir John Dalrymple, the Secretary of Scotland despised the lawless clans, seizing the opportunity presented by MacDonald, he issued instructions to remove "that set of thieves" the McDonald's of Glencoe. The certificate of McDonald's late oath was sent to Edinburgh but the government were not duly informed of McDonald's taking of the oath. Campbell of Glenlyon, with over a hundred armed men, had enjoyed the McDonald's hospitality for a number of days, when on 13th February, they slaughtered men, women and children, in all nearly forty people were killed, a few of them managed to escape to the safety of the hills. In December, 1694, Mary fell ill with smallpox, the disease that had killed both of William's parents. The Queen's condition steadily deteriorated. William was distraught but remained at her bedside until the end. Queen Mary died aged only thirty-two on 28th December. William was prostrate with grief at her death. It was to be several months before he managed to come to terms with the loss of his wife. Charles II of SpainCharles II, King of Spain, was unlikely to live much longer and the Spanish throne had no direct male heir. 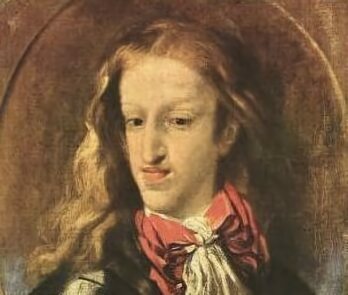 The pathetic victim of generations of Habsburg inbreeding, Charles was both mentally and physically retarded. He suffered from severe epilepsy and in him the Habsburg lower jaw was so pronounced as to appear as a caricature. He could not even chew food properly, leading to digestive problems. There were three claimants to the Spanish Empire. Phillip of Anjou, the grandson of Louis XIV, had a good claim through his grandmother, Maria Theresa of Spain, who was Charles' half-sister. The Electoral Prince of Bavaria put forward his own plausible claim. The Habsburg Emperor Leopold II also had a claim, which he resigned to his son, Charles. In the highly inbred Habsburg family, Leopold was both the uncle and first cousin twice over to Charles II. A first partition treaty was signed in 1698 by William, Louis XIV of France and the Dutch. This divided the Spanish inheritance, with the largest part going to the Bavarian Prince. His death in 1699 occasioned a new treaty, which was signed a year later dividing the inheritance between the French and Imperial claimants. Charles II died in November 1700 leaving the entire undivided Habsburg inheritance to his great nephew, Phillip of Anjou, in his will. War broke out between France and Austria. When James II died in September 1701, Louis officially recognised his son as James III. This action pushed Parliament into entering the war. The heir to the throne, Anne's only surviving child, William, Duke of Gloucester, a delicate child who suffered from water on the brain, died in July,1700. Although there were many who possessed a superior claim, the next Protestant in the line of succession was Sophia, Electress of Hanover. She was the youngest child of James I's daughter Elizabeth who had married Frederick, the Elector Palatine and was married to Ernest Augustus, Electoral Prince of Hanover. 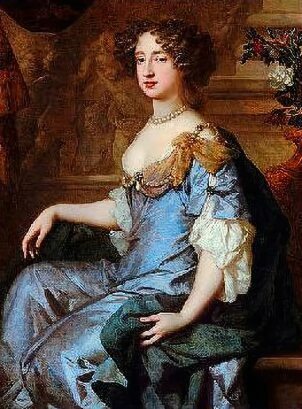 In 1701 the succession was fixed, after the death of Anne, on Sophia and her heirs, by Act of Parliament. On 21st February, 1702, William's horse stumbled on a molehill while he was out riding, causing him to fall badly and break his collar bone. He was unwell throughout the following month and did not recover from the accident. By the first week in March, his condition had deteriorated so badly that it became obvious that he was unlikely to survive. 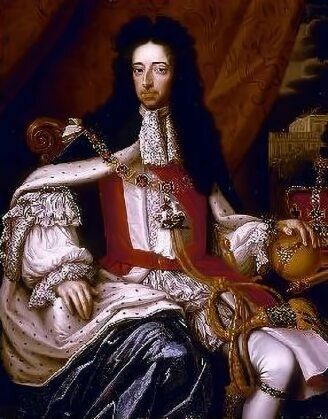 King William III died on 7th March 1702. He was later found to have kept a lock of Mary's hair and her wedding ring next to his heart. His death was not greatly lamented in England, where he had never been liked. The Jacobites ever after drunk a toast "to the little gentleman in black velvet."